I recently came across a reference to an 1877 pamphlet titled Fifteen Cent Dinners. Thanks to the wonder of the internet, I found a copy of the pamphlet online, and I got curious if the meals were as filling, nutritional, and cheap as the authors purports. 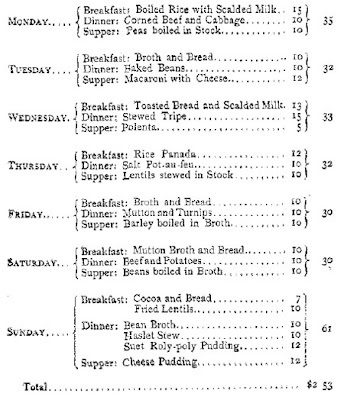 The pamphlet, according to it’s author Juliet Corson (founder of the New York Cooking School), is meant as a guideline for the poorest working class families to provide a nutritional meal on the cheap. She proposes a meal plan that can feed a family of six for three dollars a week, about $57 in today’s money. In New York, a poor, working class family usually meant a life in the tenements. My curiosity stems from the desire to understand a small part of what life was like for these families by preparing and consuming the foods that made up their daily lives. I was struck by how efficient the menu is: the stock created at lunch has vegetables added to it for supper, then reheated for breakfast. Ms. Corson leaves an extra 62 cents ($11.94 our money) which she advises is for the purchase of “extra bread, milk and butter.” I’ve decided it would be wise for me to use this money to purchase apples (because I would like to poop sometime this week) and lemons (to prevent scurvy). I’ll also be taking a daily multi-vitamin. I’ll be working with 1/6th of Ms. Corson’s given budget, so I plan to eat this week for about $10. I’ll be keeping a running tally of the groceries I buy and each day I’ll post recipes and photos of the foods I cook. Ms. Corson says that “The cheapest kinds of food are sometimes the most wholesome and strengthening…” A statement that does not seem to hold true in today’s society. The poorest classes are often the most obese, and the cheapest foods in the grocery store seem to be those that are the worst for you. Through cooking Ms. Corson’s recipes, I hope to tap into an older, and perhaps wiser, way of eating on a restricted budget. Or I might just end up constipated. I begin on Monday. Our educator and I were reading this and had a question that perhaps you can answer for us? When did the working classes move to a “lunch and dinner” rather than “dinner and supper” schedule, i.e., when did they start to eat the main meal in the evening rather than the afternoon? I know further up the social ladder that switch had long since occurred, but I also know that trends in dining (such as the adoption of the use of the fork) took a good while to move down the social ladder from the rich to the poor. It seems odd, though, that even in the 1870s workmen would all be assumed to be going home for the mid-day meal. Was it just that more were involved in piecework or home businesses and so they were already at home? Or worked near enough to return home? Any thoughts??? He claims that a big noontime meal was out of fashion by the 19th century–but I disagree. This pamphlet, for the working class, has the largest meal at noon. I think it would be likely that a man would go home for a large meal; because the meal is less dependent on what he is doing, and more dependent on the availability of his wife to cook it. I think the transitions of the noonday meal happens with industrialization, and more specifically with woman going to work. I think WWI and The Great Depression were the final nails in the coffin–after the stock market crash, married women were going to work in record numbers. Since the women were not home at noon to cook a meal, I think it was a natural transition to move that big meal after work. Society has changes, work and school schedules have changed, and so a large after work meal still suits our schedules. These are my theories–I’d have to pull together some early 20th c. menus to back it up.